Much has been written since the breaking story on Planned Parenthood’s selling of fetal tissue from abortions. Not surprisingly, mainstream media outlets were slow to pick up the story, and many of them largely parroted the Planned Parenthood defense when writing their stories. The video caused quite the stir on social media, amassing countless shares and millions of views on YouTube. Interestingly, nearly all responses from the left and some from the right seem to miss the real reason for this impact. It is not so much that Planned Parenthood is doing something illegal or secretive (though it may well be violating multiple laws). It’s that this particular story brings into vivid relief the reality of what Planned Parenthood and other abortion providers do on a daily basis. The killing of unborn children is so often out of sight and mind. For certain, pro-lifers have worked tirelessly to enact legislation to reduce the number of abortions, and they have made the case for life in public demonstrations and private conversations. But the average American rarely encounters the graphic details of abortion. To hear Planned Parenthood executive Dr. Deborah Nucatola speak so clinically about the very human organs they harvest from these children and sell for scientific research – over a meal, no less – seems like something from a dystopian novel. Some liberal commentators are correct – the main thread of Planned Parenthood’s practice is legal and is likely sold to young mothers as the “generous” thing to do with the bodies of their unwanted children. As Planned Parenthood states, it’s for “life-saving scientific research”. Moreover it is not ethically much different from our decades-long practice of abortion. Many people sharing this story on social media may indeed not have known that these “donations” are legal, but I suspect that this is not the real cause of the furor. The reality is that most Americans, especially casually pro-choice Americans, do not spend time thinking about the child that dies. They do not picture its body parts, its organs, its very real humanity. They don’t think about the forceps… the doctor using ultrasound in order to “crush” the life out of the baby while preserving the health of profitable organ tissue. Through this story they are confronted with the grisly reality of abortion and presented with the difficulty of maintaining their “woman’s choice” position in the light of dead baby parts. The objections from pro-choice columnists have been weak. Some object that pro-lifers are hypocritical by only now filling Facebook and Twitter feeds with this grotesque story, but of course such an extreme and vivid version of this always-present horror will provoke such sharing. Many have claimed that the video is “highly edited” or sensationalistic or manipulative, but the moving part of the story is none of these things. The impactful center could not be clearer: unborn humans are being killed and their body parts sold off. The visceral reaction is legitimate. We have no problem talking about adults who have donated their organs. It is not the process of harvesting organs from the dead that is so troubling. This harvesting of the unborn is different precisely because it brings to the forefront the humanness of the babies that are killed. That is the motivating kernel. Perhaps this story will lead to change. Perhaps it will further multiply the increasing number of Americans who are opposed to legal abortion in many-to-all cases. Perhaps it will lead to the eventual overturning of Roe v. Wade. In the very least, perhaps it will lead to cutting out the hundreds of millions of taxpayer dollars currently flowing into Planned Parenthood’s coffers. But there is a greater problem this is sadly unlikely to resolve. While picturing a developed baby being dismembered and sold piecemeal will give many in the pro-choice camp pause, it is unlikely to lead many to a reconsideration of their philosophical position on human life. And the greatest threats to the unborn child today happen early in pregnancy, before the child is so tangibly human. 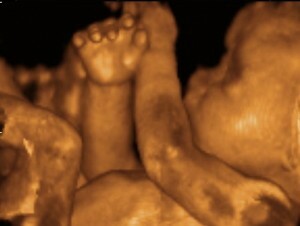 Our developing technologies have led many more people to see the very-human nature of a near-term unborn child. This is why pro-lifers have advocated for ultrasounds before a woman commits to an abortion. The humanity of the child is visually evident. But a first-trimester child does not look so much like a baby, and most abortions in the future will be achieved in these early stages through pharmaceutical advances. The core question is plain: When does a human become a human? Human life demands our protection. There is no sliding scale of human dignity, dependent on how convenient the life is or how difficult it is to protect that life. Ultimately there are only two real options: Either accept that human life begins at a set point and protect it from that point on, or proceed down the Peter Singer road of the utilitarian ranking of humanity. The average American would prefer to avoid committing to one position or the other, but this story brings to the forefront the reality produced by our passive abdication of our moral responsibility to think, decide, and protect. If, as I believe, human life begins at conception, then a bunch of cells that looks little like a human is indeed human and its life is worthy of our full protection. Thus our increasingly-effective pharmaceutical abortions are just as much killing as a partial-birth abortion. Tragically the visual difference between first trimester and third trimester babies will likely lead to countless unborn children continuing to die in silence, without the possibility of such provocative videos shared online to change minds. Nor is it only pharmaceutical abortions that are at issue. There are a host of bioethical quandaries at hand right now, but the public has little-to-no understanding of these questions. This video may cause a cultural backlash against abortion in the later stages, and it should be praised for that, but we must have a deeper conversation about human dignity that centers on our definitions of life and moral duty. Sadly, in an age of increasing flexibility on ultimate questions, it is hard to imagine a new consensus taking shape. In the absence of that consensus, scientists, doctors, and individuals who find a child inconvenient will continue to do as they will. We make the Spartans’ practice of leaving unwanted babies to die of exposure look mild, but at least our modern atrocities are hidden in bathrooms and surgical rooms, right?